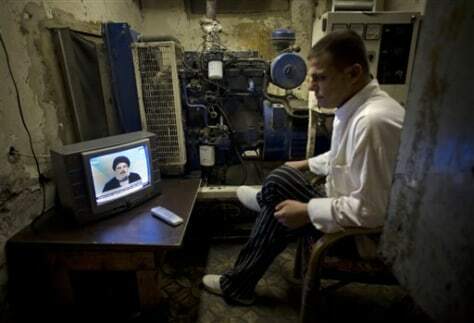 A man watches the speech of Hezbollah leader Hassan Nasrallah in Beirut, Lebanon, on Sunday. The leader of Lebanon's Shiite militant group Hezbollah says Saad Hariri should not return as prime minister. Nasrallah made his first public comments Sunday since ministers from his movement and their allies resigned from the Cabinet on Wednesday, toppling Hariri's Western-backed government.